← Where have I been? Getting ready for a quilt show and a giveaway, of course! Diamonds & Rust might seem familiar to some of you; I designed it when I was a finalist in the 2012 McCall’s Quilt Design Star contest. I was intent on quilting it myself for the upcoming show and that’s exactly what I did. I always get a bit nervous when I sit down to quilt a piece. It’s almost like I forget that I know how to quilt on my home machine (a fantastic Janome 7700!). 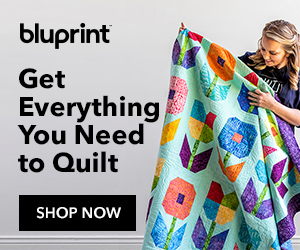 I’ve done it many times before and once I start quilting I always enjoy it. I just have to get beyond my initial jitters. I used a combination of stitch in the ditch, gentle curves with my walking foot (my Janome has an open toe Accufeed foot which gives great visibility) and free motion quilting. I tried not to overdo the free motion quilting, because there’s a lot going on with the design of the quilt. I used it in the yellow background in the center, the lightest blue backgrounds and the teal in the middle border. I did a simple stipple and I’m really pleased with how it came out. In the next few days I should have photos of it hanging in the show, as well as the quilt I featured in my last blog entry. I dropped off both quilts today and I’m looking forward to seeing them hanging with the other 400 quilts on Tuesday when the show opens! Several friends are showing quilts and I hope to post photos of their lovely work too, if they give me the okey dokey. Very interesting design. Good luck!